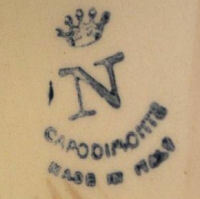 Capo di Monte, unlike other collectible porcelain names, such as; Hummel, or Royal Doulton, – which are brand names, is instead a regional name for a style of Italian porcelain figurines, vases, and other pieces, made in the Capodimonte, (sometimes written as Capo di Monte), region of Italy. 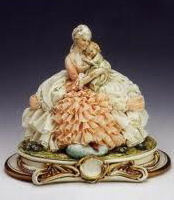 Although there are many more types of porcelain pieces produced in this area, like; trinket boxes, bowls, etc. 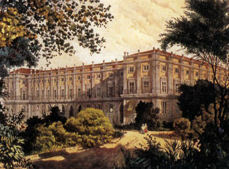 – the ornate and colorful designs of the Capodimonte style are especially impressive in the three areas mentioned. 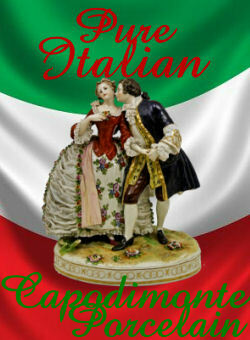 Rare and retired Capodimonte pieces command some of the highest prices of all Italian porcelain collectibles. 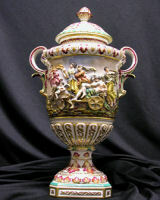 Capodimonte is a very vivid and ornate style of porcelain design. And generally very colorful. Capodimonte flowers, whether as an individual piece, like a bouquet basket, or as decorations on other pieces, are easily recognizable – and very collectible. Unless you have stumbled onto an extremely rare find, almost all antique Capodimonte pieces available in today’s collector’s market will be from the late 1800’s to mid 1900’s. The more rare 1700’s and early 1800’s pieces are usually only found in museums, and seldom become available in the open market. Although there are many online antique shops selling Capodimonte porcelain, ebay has turned out to be the most reliable source for finding and pricing these collectables. 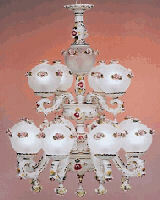 You will find that even dedicated antique shops and sites refer to, and check, ebay first. Just click any image to see the pieces available right now. Looking for another Capo di Monte piece? Didn’t find it on ebay? 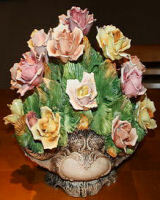 See ALL Capodimonte Figurines on Amazon now! Free Cash-Back & Coupons for Members! A note about shopping links and referrals: Most of the product links here are referral links which benefit this site but have no affect on your price. These links have been researched to provide the cheapest prices available online so you don’t have to spend hours searching through the thousands of possibilities.